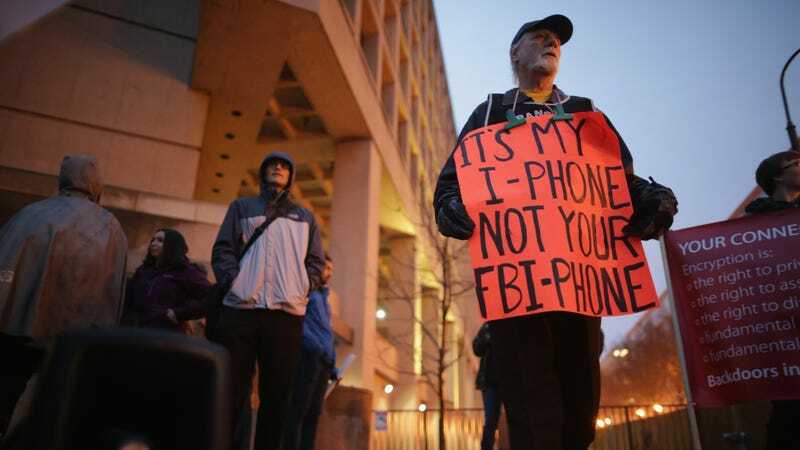 Apple is waging a vicious war in the court of public opinion against the FBI and its court order mandating Apple to hack an iPhone. It’s a big deal, but despite the hand-wringing rhetoric, Apple has failed to make the general public actually care. The top photo comes from a demonstration this afternoon in Washington D.C, one of 40 planned actions protesting the FBI’s demands across the country. Sadly, despite the impressive level of organization, few people seem to have turned up—according to Getty, around a dozen protesters turned up at the Washington demo, and a picture from the San Francisco rally shows more TV cameras than signs. Similar levels of apathy are on display in a poll posted yesterday by Pew Research Center, which showed that of 1,000 adults surveyed, only 38 percent sided with Apple. All this is not to say that people should support the Justice Department: it’s that Apple is choosing to fight this argument very publicly, assuming that it could rely on the support of the hundreds of thousands who queue for days just to give Apple money. Hopefully, the legal strategy (Apple’s reply to the court order is due Friday) will be a little more successful.